I have had these fruit prints for a long time. They came from my grandmother stuff but I do not remember how or when I got them. But I know they were hers. I am guessing they are over thirty years old but I am not exactly sure. I have always liked them but have never been sure exactly what to do with them. I had the prints put away in a box in a closet. I was recently cleaning out closets and came across them again. I decided it was time to figure out what I wanted to do with them. I decided to frame them but I did not want to spend a lot of money. I took them into Hobby Lobby (a craft type store in our area) to see what I could do with them. Having them framed was more than I wanted to spend but I thought I could have the mats cut and than buy the frames separate. This would save quite a bit of money. Usually when I have things framed I recommend doing it right. I have had several things framed at Hobby Lobby and Micheal’s that fell apart or sagged in the frame within a year or two. If it is a really nice handiwork type piece I highly recommend using a speciality frame shop. But for these prints I did not think spending a lot of money was worth it. I found some black frames that I really liked and I had black mats cut to match. I thought it matched with my other stuff well and was a nice clean look. I also thought the black made the color of the fruit stand out better. 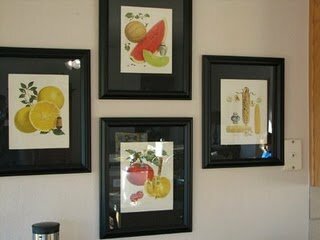 So here are the fruit prints from my grandmother framed and hanging in my kitchen dining area. Sorry for the glare on the glass. For more antiques and unique items see Antique Thingies Thursday and Show and Tell Friday. The black frames do bring out the colors of the fruits. I know what you mean about framing. I go through the same dilema. I often have more invested in the frame than I do the artwork. Take care. Catherine, I liked XXXX but we did not have room. We tried two across, two down like you said also and I did not like it. I am not sure why, I think if you saw the whole room it might make sense. But I like change so in a few months I might move them around. Very nice. I love old prints. The black looks great with them. And to top it all off, they belonged to your grandmother. Wonderful. WOW they are stunning and they really pop against the black matting and frame….I also love they way you’ve grouped them…great impact!! They really look great with the black frames. Love the detail in the prints. Very nice, you’ve reminded me of a few fruit prints I haven’t used yet. Thank you for sharing! Your fruit prints turned out beautifully. Love the black frames. Great items on the wall…I like the dark frames around them too. My show n tell is Halloween, solar lights since most all my visitors have been asking for some of my halloween decorations I’ve been setting up…and a set of kitchen linens that match my blog’s header that I found! Come on by if you can find time…Happy Friday! I love how you took your grandmothers collections and turned them into treasures. You did a beautiful job framing the pieces and I love the arrangement. They look great! I think the black frames make the color of the fruit really pop. Love the way you have them grouped on your wall! Isn’t it great when it all comes together? The black is so crisp, and the prints are so vintage-perfect match! What a great idea to frame the prints. I’m not sure I would have thought of that, and they’d still be in a box. They look great on the wall!